What am I getting for the price of the service?You receive a full perimeter exterior application, including dusting harboring areas, glue traps, baits for crickets, ants, cockroaches, etc., immediate access to our office staff, regularly scheduled services within 15 minutes of the appointment, and the same technician for each scheduled service. 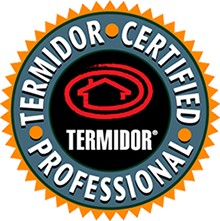 We offer several upgrades to your service should your home warrant a more specific approach. We recommend upgrades in the event of high pest pressure situations, i.e. scorpions and rodents. Should you wish to have the interior of your home treated during your scheduled maintenance we include that at no additional charge. Are you able to control scorpions?Yes. Scorpions are resilient, but they are still susceptible to the products we apply around your home. Should you encounter an abnormally high amount of scorpion activity, we have several other methods to entertain that will remedy the situation including sealing the home. Is the service safe for my children and pets?Yes. Before an insecticide can go to market, each has to undergo field trials approved by the EPA. This takes years of development in an effort to prove a balance between safety and efficacy. Once a licensed pest control company is able to utilize the product, it is diluted to a specific rate of active ingredient designed to target only those pests we wish to control. We encourage the consumer to hire only a licensed company with certified applicators to ensure the product is being applied safely. What is the most common service selected by your customers?Depending on your threshold (your willingness to deal with pest activity) you will want to choose between a monthly general pest control service and a bi-monthly service. Homes susceptible to high pest pressure generally warrant a monthly service. Other homes can be controlled with bi-monthly service (6 services a year). Are you licensed and Insured?From licensing to liability and everything in between, we are completely covered. Do you warranty your service?We absolutely do. Monthly and Bi-monthly services are provided a warranty the duration between each scheduled service. Should you encounter an issue between services, we will return at no charge immediately to rectify the problem. We anticipate you expect to get what you pay for and we have complete confidence in our service. Should you be unsatisfied with the service, we will refund you the cost of that service. Does general pest control service cover termites?Subterranean termites (the most common here in Arizona) are controlled by treating beneath the surface of the soil and require a separate application and bid. Though a topical insecticide (the product used for your general pest control service) will kill termites, it is not capable of controlling termite activity. General pest control service is designed to control above soil crawling insects and therefore does not cover termites. Do not hesitate to contact the office should you have questions about our termite program. Will I get the same technician for each service?Yes. We pride ourselves on creating a work environment that encourages employee longevity. In doing so, we not only create more stability internally, but it also has a positive effect externally. We understand how important it is to have someone you trust in and around your home. We go to great lengths to ensure that a recognizable face greets you at each service. Should your technician be unable to perform your service, the office will notify you of the technician filling in. Are you independently owned?Yes, we are a family owned company and have been since 1972.